Protesters have taken over the centre of the Egyptian capital Cairo on the sixth day of demonstrations against the rule of President Hosni Mubarak. The police, who have been involved in violent clashes with protesters in recent days, have largely disappeared from the streets. There is a heavy military presence in the city, but soldiers are not intervening. Meanwhile, al-Jazeera’s broadcasts via an Egyptian satellite have been halted. The Egyptian government had earlier ordered the Arabic TV channel, which has been showing blanket coverage of the protests, to shut down its operations in the country. Clashes between protesters and the security forces – mostly riot police – are reported to have left at least 100 people dead across Egypt since rallies began on Tuesday. 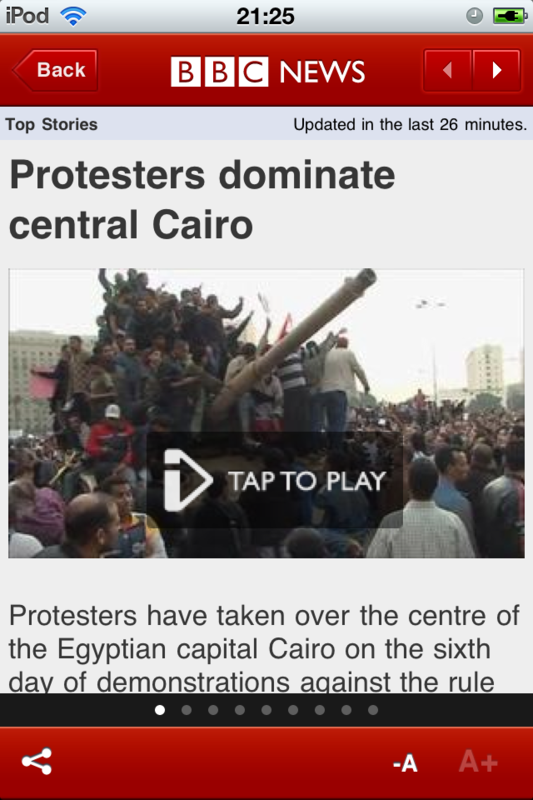 Thousands have been injured as violence has flared in cities including Cairo, Suez and Alexandria. In Cairo, many protesters defied an overnight curfew to camp out in Tahrir (Liberation) Square, the focal point of the demonstrations in the city.Sunday provided some of the most amazing images of this uprising so far. In central Cairo, an army officer was carried aloft on the soldiers of cheering protestors. With tanks still on the streets, no one yet knows if President Mubarak will order the army to turn against the protestors, But scenes like these are potent and powerful. Just off the main square we found a reminder that people are still being killed and injured – a makeshift field hospital where volunteers were treating people shot by police; no anaesthetic and basic medical to treat severe gunshot wounds. One doctor told me that 50 people had been killed in Cairo alone in the last 24 hours. Chants of “Mubarak, Mubarak, the plane awaits” could be heard on Sunday morning, a reference to protesters’ hopes that President Mubarak will step down and leave Egypt. Many protesters once again climbed onto tanks and armoured vehicles around the square, with many soldiers apparently on friendly terms with the anti-Mubarak demonstrators. Sunday is the start of the working week in the Middle East, but many businesses in the capital are closed. Internet access remains intermittent. The BBC’s Jeremy Bowen says that although key government buildings are under heavy guard, there appears to be a vacuum of authority in large areas of the city. Throughout the city, armed citizens’ groups have formed to respond to the widespread looting and disorder that has accompanied the growing sense of lawlessness. Across Egypt, thousands of prisoners are reported to have escaped from jails after overpowering their guards. Western leaders have urged President Mubarak to avoid violence and enact reforms. Mr Mubarak has appointed a vice-president – intelligence chief Omar Suleiman – as he struggles to regain control. Aviation Minister Ahmed Shafiq has been appointed prime minister. Sunday saw a number of Egyptian political movements issue a joint statement calling on leading opposition figure Mohamed ElBaradei to form a transitional government. Israeli Prime Minister Benjamin Netanyahu has said his government is watching events in Egypt carefully, and hoping to maintain peaceful relations with its Arab neighbour. The Rafah crossing between Egypt and the southern Gaza Strip is closed, Palestinian officials say. The US government, which previously had advised US citizens against non-essential travel to Egypt, is now advising Americans in Egypt to consider leaving the country as soon as possible. The UK has advised against all but essential travel to Cairo, Alexandria, Luxor and Suez. A number of other European countries have also advised against visiting the country. The unrest in Egypt follows an uprising in Tunisia two weeks ago which toppled President Zine al-Abidine Ben Ali after 23 years in power. The Tunisian upheaval began with anger over rising food prices, high unemployment and anger at official corruption – problems which have also left many people in Egypt feeling frustrated and resentful of their leadership.